I work with adolescents who are depressed and some have suicidal ideation. This sandtray lesson is for adolescents who have been experiencing major depression and suicidal ideation. Suicidal ideation comes from rigid black and white thinking that says either or but nothing in between. Depression results in telling ourselves the same negative, unhealthy stories over and over again. These same stories create ritual behaviors or habits that in the case of suicidal or depressed teens tends to be very unhealthy. Most of these stories are based on deeply held beliefs and the ritual or traditions are an expression of the beliefs. Adolescents who are suicidal or experiencing major depression have difficulty seeing that some of the stories may be helping to create unhealthy rituals and that the story may not even be true or that the story can be viewed in a different manner. Cultures use rituals and traditions to show what is important to the people. Rituals and traditions display deeply held beliefs. Hindusim celebrates tradition and rituals through stories. The traditions and rituals are passed down through various stories, which are told to explain the purpose or origin of the tradition or ritual. The stories use symbols to represent ideas or sometimes symbols are created from the stories. Throughout the world the tiger symbolizes prosperity, strength, and agility. It is also seen as the essence of the feminine force. The tiger is a relatively solitary animal and is rarely seen by humans. The tiger is revered and yet also feared. The tiger is considered the guardian of the jungle. As Lord of the Jungle, the tiger protects, guards, and kills those breaking the laws of the jungle. People in India understand that not only is the tiger the protector of the jungle but that it is a fierce and dangerous animal that kills and yet it is beautiful. Many sayings in India refer to the tiger’s strength and suggest that if a person wants to prove their own strength then they must prove to be stronger than a tiger. As a miniature the tiger can symbolize strength and beauty. It can also symbolize the dichotomy of character. The tiger may be used to symbolize fierce protectiveness and act as a guardian. An elephant with a raised trunk is a good omen or sign, which indicates rain or blessing coming down. The elephant head in particular can show us having large listening ears and a big thinking head. The elephant is one of the largest land mammals and is known by most to be a highly intelligent animal. In the sand tray an elephant’s meaning will depend greatly on the client. Hinduism reveres cows as a source for food and a symbol of life. Cows provide milk, labor, and religious inspiration. The cow yields five different products, which are used in worship and in penitent rites. These products are milk, curds, ghee butter, urine and dung. Milk nourishes the family and children in particular as they grow. Cows in the sandtray can be interpreted many ways depending upon the client’s culture. Clients may view the cow as a provider of milk and nutrition but most will not revere the cows as a client who is Hindu. A Hindu client placing a cow in the tray may be showing signs of connecting the world to what is sacred. One important ritual for Hindus is mandala making. Mandalas can be found in religions throughout the world and help to connect people to the spiritual as well as helping them feel centered and present. Mandalas can take a lot of time to create and color depending on the size and intricacy. The intricacy of most mandalas forces us to concentrate and pay attention to details; this creates an environment where we are fully present. The first session the client is to make a mandala. On the mandala they can choose to decorate it with symbols of people, things, or rituals that brings them peace and joy or they may choose to only color it. Either way explains to the client that this is their time. Some teens may want to talk while they create their own mandalas others will not. Many teens will feel self conscious about coloring or doing an “art and craft” project. Some may say that coloring and such is for little kids. If a client seems to be resistant then the counselor may try to model the behavior; start coloring and decorating your own mandala so the client can feel at ease and see that it is not an “art project” for the little ones. When they are done with the mandala invite them to explain it and what it means to them. 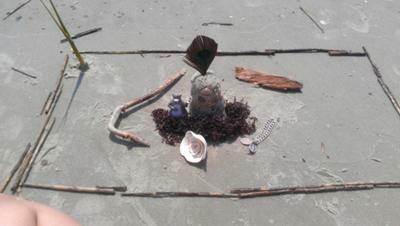 Then ask them to place the mandala in the mini sand tray. The client may choose to place other miniatures in the mini tray but remind the client that it is not necessary and is completely their choice. They will be doing a full sand tray next time. 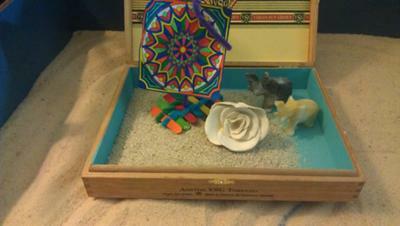 I colored a mandala and placed it in the mini sand tray by attaching it to a raft. The mandala has come to represent God for me and my relationship with Him. I placed elephants as well because I was reminded of their significance of blessings. I placed a white flower in as well to symbolize a lotus flower, which in Hinduism symbolizes rebirth, purity, creation, and spirituality. For me the flower in the tray symbolized the growth of my spirituality. These simple concepts gave me a great amount of peace, which is what this first activity is meant to help the client find. The counselor is to explain how the stories we tell ourselves are important to how we view the world. Through these stories we create our own rituals and traditions. Some rituals and traditions come from our culture, country, family, religion, and even ourselves. Using the mandala from the last session, ask the client to do a sand tray showing what traditions and rituals are important and helpful in their life. When they are done with the sand tray invite them to explain the world they have created and what it means to them. Ask about what stories and rituals are important to them and how those stories and rituals are important. 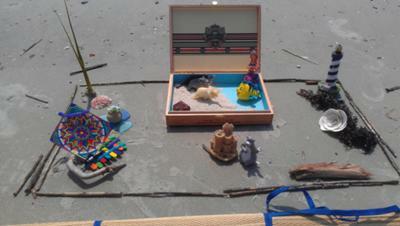 I created a sandtray while I was on the beach last week of the various stories that are important to me. I started off with the small sandtray thinking it would be large enough but then I added the surrounding space on the beach and created my own sandtray. 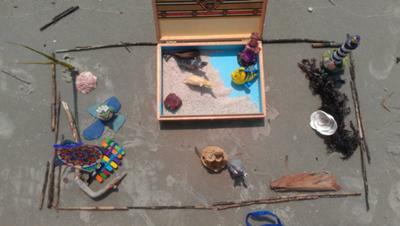 Most of the stories in my own sandtray had to do with my family and the rituals that have come from those stories. One of the stories is the fact that my dad has always loved the beach and has always told me stories about the ocean and how important it is to him. This meant when I was little my dad always tried to take the family on vacation to the beach. My dad is represented by Beleuh the bear and is next to the sand castle, which is something he always used to make with me as a child. Another symbol in the sandtray is the raft with the mandala sail. The raft represents God always being there for me and one of the rituals that have come from that for me has been that I go to church every Sunday and it brings me a great deal of peace and joy. The two elephants represent the church community. Some of the other miniatures I think were influenced greatly by the space I was in—I was at Tybee Island and was feeling very nautical and nostalgic as the island and the beach in general holds many good memories for me. Although rituals and traditions can help us connect with other humans, some rituals or traditions are unhealthy. Some are based off of false stories and stories that do not really help us. This can create a false sense of who we are and may lead us to feeling unsettled. This feeling of unsettling can be particularly difficult for adolescents who are just figuring out who they are. Therefore create a sand tray of the stories that need to be revised and how would you revise the story so you can create your own traditions and beliefs. When they are done with the sand tray invite them to explain the world they have created and what it means to them. Ask about what stories and rituals are important to them and how those stories and rituals are important. This sandtray was more difficult for me first off because it can be unsettling to think about what lies do you believe but also because I was in such a positive space I did not want to think about it—I was on my vacation and thinking negatively on the beach is difficult for me. I created a sandtray though that showed how religion was a ritual for me but that it had held little meaning and there was no personal relationship with God in the past. I also showed how I had viewed my Dad in that he was just there showcasing a home that looked pretty on the outside but inside was a mess. The sandtray is rather empty also because that is what I used to believe, that life is empty and the best way to avoid being hurt is to have no one there. These sandtrays were very healing for me to recall the good and the bad and then to see how I have transformed the stories. This sandtray lesson would work well with teens who are suicidal and experiencing major depression.